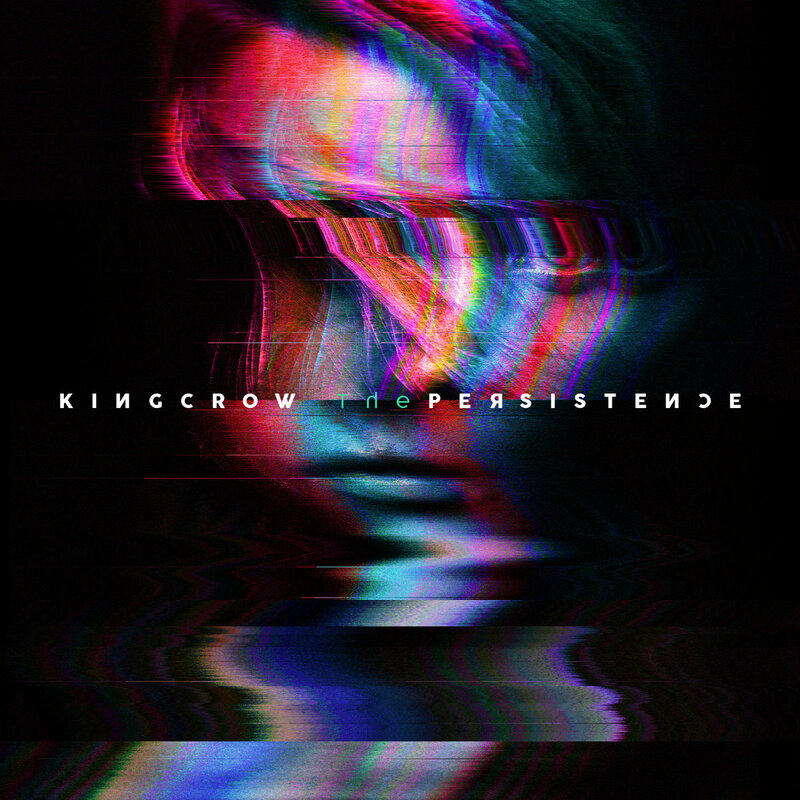 The Persistence continues the evolution of Kingcrow. Their signature mix of euphoric melodies and pop sensibilities hide some real gems in among the somewhat ‘lopsided’ album experience. Kingcrow have been bubbling around for quite a while now, and I personally found their previous album, Eidos, pretty damn smart. The Persistence shows that they’ve continued to hone their craft and mix in some great progressive metal influences, while keeping the positive, upbeat vibe that makes their music so catchy, albeit with some missteps along the way. From the get go, “Drenched” brings together the now familiar elements of the band; angular riffing, sweet drums and that soaring vocal of Diego Marchesi. It set the scene for what I expected from the rest of the album. Almost like a warm up to the really good stuff. Initially, however, this wasn’t the case. “Closer” brings the mood down to something a little darker. The grumbling, synth-led track pumps along nicely, but falls into the ‘quiet verse, loud chorus’ formula a little too obviously. The instrumental breakdown towards the end saves it from itself, however. This section combines the gritty synths and guitars, giving that Haken-like feeling that seems to be the ‘new’ sound that most prog-metal bands are trying to copy. Even so, it feels good. The rest of the first half of the album focuses more on this laid back feeling. “Everything Goes” combines atmospheric piano with a dubstep-like drum machine. It’s like a shoegaze pop single at times. Sonically, it sounds pretty standard, generic synths and loops being used liberally. The multi-layered backing vocals do add a nice touch and much needed interest. “Folding Paper Dreams” doesn’t really change this pace. The echo’y vocal and prominent synths lead the way, but the slower tempo means that the track drags on a little too long for me. The instrumental middle section amps it up somewhat, though it sounds slightly out place with the rest of the song. The title track also continues this slower vibe and is really a little too much of the same thing. It covers enough ground to be good, but doesn’t provide anything super memorable. After the great start with the opening track, I did wonder if the band still had the magic. Thankfully, once I hit the midpoint of the album, things started to get more interesting. The start of “Every Broken Piece Of Me” made me initially think that the band were going to give me yet another long, slow one. I was wrong. It builds up well and morphs successfully into a Porcupine Tree style riff-a-thon. It’s welcome at this point in the album to be honest. The angular rhythms and punchy guitars are head nodding worthy. The backing vocals keep that Kingcrow euphoric feeling alive and well. This track represents a resurgence of the more upbeat and rocky feeling that I know and love about the band, crossing the line between modern progressive and pop. “Devil’s Got a Picture’ focuses heavily on a pop-driven arrangement and works pretty well, with the heavier side of the band making an appearance at the end. “Father” continues the pop styling with the choices of synths and simple melodies. A little bit of pseudo-Djent makes a brief appearance here and there. Not overdone, it gives the track a nice edge. The high energy chorus and angular polyrhythmic ending of “Father” is classic Kingcrow at their best. “Night’s Descending” brings back the more sombre mood of the first half of the album, but I feel that it’s done much more successfully. The epic multi-tracked guitars, vocal and synth-orchestra give this song the full mid-tempo epic feeling that prog fans love. The emotional performance of guest vocalist Daniel Gildenlöw (The Sea Within, Pain of Salvation) really does take things to a new level. The melodic guitar solo at the end is like something Steve Rothery from Marillion would give a go. Great stuff and it doesn’t outstay its welcome. Regular readers will know that I love a good album closer and Kingcrow pretty much deliver with “Perfectly Imperfect”. Atmospheric synths, wall of sound guitar and long note melodies are all here in force. They combine to give a great anthemic sound that I imagine will translate really well live. Again, the backing vocals add an additional layer of interest and euphoria to the track. A nice wind down, though the fade out is a little too early for my tastes and makes the track feel somewhat unfinished. A minor gripe. Overall, you kind of know what you’re getting with The Persistence, so my feelings are mixed. On one hand, the generic soundscapes and keyboards dampen the excitement somewhat. They veer between modern prog and pop-driven sounds, which are so familiar now to fans of this genre that they lack any real surprise. The track ordering probably plays a part in the downbeat feeling of the first half of the album experience as well. On the other hand, things are put together really bloody well. The standout tracks feature some awesome songwriting moments. The melodic sensibility and super singable choruses of tracks like “Drenched” and “Devil’s Got A Picture” are so catchy they’ll likely be stuck in your head for days. A good sign. For fans of the more accessible and commercial side of current modern prog / metal movement, The Persistence is worth adding to your collection. It’s also great to hear a band that embrace the more euphoric side of prog metal, a relief from the post-industrial wasteland vibe out there at the moment. Between the slower, more drawn out parts, Kingcrow pen some real gems and great ‘feel-good’ moments that are worth listening to and being uplifted by. Previous PostHaunt - "Burst Into Flame"
Next PostIglooghost - "Clear Tamei"/"Steel Mogu"